Hello! Today I have a quick Pretty Serious Cosmetics swatch to share with you. They have recently released a limited duo inspired by the Pantone colours of the year for 2016 - 'Can't Take The Sky' (periwinkle), and 'Use The Quartz, Lone Starr!' (pale pink). Unfortunately I didn't think that the pink would suit me, so have only purchased 'Can't Take The Sky' for now. Read on for my swatch and more info! 'Can't Take The Sky' is a baby blue/periwinkle creme. The formula is very smooth and self levelling, and so easy to apply. It was surprisingly opaque on the first coat, although did have some streaks. A second coat evened everything out and covered perfectly. This also dries very glossy. Below is two coats and topcoat. What do you think? I think it is gorgeous, it's so soft and pretty. I also think the colour is quite versatile and could be worn all year round. It would be amazing with pastel flowers in the spring, or as an icy blue for the winter. I actually did some stamping over this - keep an eye out for that post soon! You can find 'Can't Take The Sky' on the Pretty Serious website here, or on Rainbow Connection (UK) here. This is a beautiful colour! This type of blue usually looks ghastly against my skin tone so I'm jealous it looks so pretty on you! 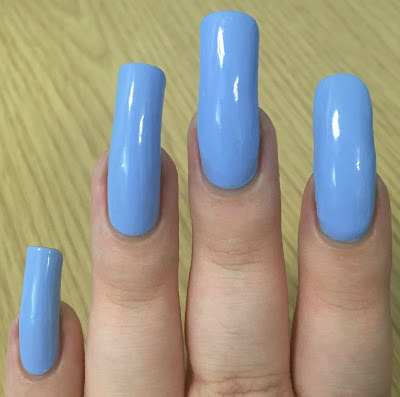 It's such a lovely soft blue shade, and i always a sucker for blue! This specific blue will fit so well with most of my blue clothes! It looks good! I can't wear pastels, they look so bad on me. Waiting for next year's Pantone colour already! My one of the fav shade ! 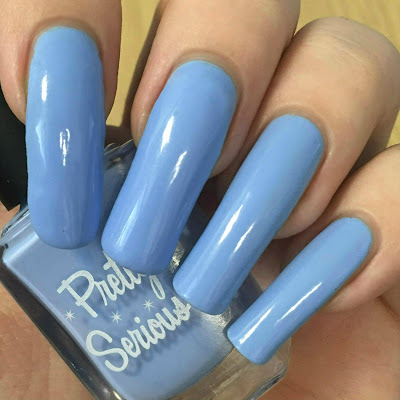 I love the pastels and this blue is really gorgeous n you swatched beautifully asusal.